The Sun-Scorched Arenas of the Dread Sea Dominions Await You in This Book! 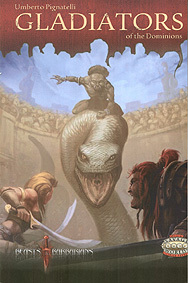 In these pages you'll fight ancient monstrosities from the pits of Tricarnia to entertain the bored Priest Princes, you'll risk your life against beasts in the Imperial Arena of Faberterra for the enjoyment of the crowd, or you'll match your skills against the pit fighters of Syranthia, the best in the world. You are a gladiator: men shout your name, women faint at the sight of you. But when you enter the pit, under the merciless sun, you are alone against your opponent. Today, will it end with your blood or his dripping on the sand? So what are you waiting for: grab your gladiator helm, your shield and sword, and go bare-chested to spill your blood for glory and money! The Season of Blood: In this appendix you'll find all the rules you need to run a GM-less league of gladiator fights in the arena. Hire your pit fighters, buy assets and resources, and lead your team to victory!